I love milk be it plain, with chocolate, rose syrup, kesar(saffron), etc etc. The options are endless. Thandai is usually made during the Holi festival. I made thandai during Holi but didn’t get a chance to blog it. Can’t wait till next Holi. Anyway anytime can be thandai time. Its a healthy cooling drink to have during the scorching summer heat and also an energizer. I hate the commercially prepared one as it contains colour and essence and not even sure if they are using almonds, pistachios, cashew nuts considering the cost of these nuts. Traditionally thandai is made by grinding all the ingredients using a sil batta which is basically a large flat stone and a stone rolling pin to a paste and then is strained and squeeze in a muslin cloth to obtain the flavour. I personally prefer just grinding the dry ingredients to a powder and storing it as I feel that the traditional method results in wastage of fine and expensive ingredients. 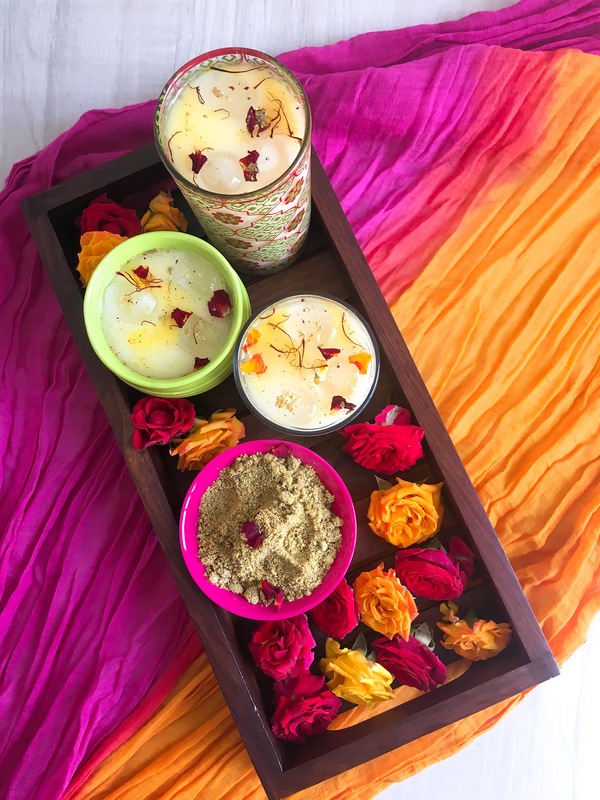 Hope you like my version of thandai, especially since you can make it in bulk and store in an airtight container or the fridge for further use. With so many people wanting healthier options, the sugar can be replaced by using honey, maple syrup, agave nectar or stevia. Every household will have its own version of the thandai powder or paste. Some add pumpkin seeds, some add watermelon seeds. The amount of spices used vary. Remove the seeds from the cardamom pods. Roast aniseeds, poppy seeds, cardamom seeds, peppercorns over very low flame till you get the aroma of the aniseeds and poppy seeds will begin to pop. Take the pan off the heat. Mix in the saffron. Put the spice mixture, nuts and seeds in a coffee grinder and process it into a fine powder. Divide the powder between 4 glasses. Add the cold milk and sugar. Mix well. You can add powdered sugar to the mixture and keep it. I don’t add it as I would like to use other sweeteners for diabetics and those who don’t take sugar. If you prefer a slightly pungent taste add a few more peppercorns. Serve as a dessert. Instead of ice top it with kesar pista or vanilla ice cream. Store the extra masala in an airtight container in the fridge.